Russian cosmonaut Oleg Kononenko, Expedition 30 flight engineer, poses for a photo with a Russian Orlan spacesuit in the Pirs docking module after a spacewalk outside the International Space Station on Feb. 16, 2012. 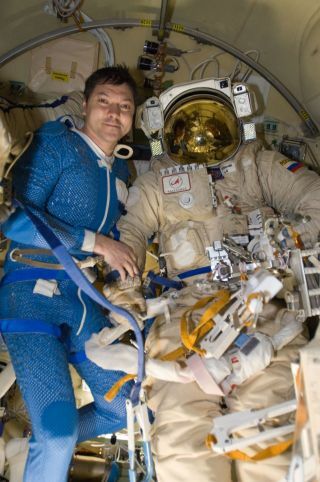 Kononenko is wearing a blue thermal undergarment that complements the Orlan spacesuit. Three Russian cosmonauts may be flying hundreds of miles above Earth on the International Space Station, but their mission did not keep them from voting in their country's presidential elections on Sunday (March 4). The cosmonauts, who make up half of the space station's six-man crew, voted with the help of their Mission Control Center just outside Moscow, as well as the Yuri Gagarin Cosmonaut Training Center in Star City - where the cosmonauts live when on Earth. "That is the main location for cosmonaut training, and also where the three station crewmembers reside," NASA spokesman Dan Huot said during daily commentary from the station's U.S. Mission Control room in Houston. Russia's Prime Minister Vladimir Putin, a former president of the country, won the election in a contentious victory, according to the AFP wire service. According to Russia's Federal Space Agency, station cosmonauts Anton Ivanishin, Oleg Kononenko and Anton Shkaplerov made an early request for the chance to vote in Sunday's election. To do it, they gave their votes to Cosmonaut Training Center employee Dmitry Zhukov, who was in the Russian Mission Control to serve as a proxy. Zhukhov recorded the votes for each cosmonaut, then filled out individual ballots on their behalf and dropped them into a special ballot box as election officials observed, Russian space officials said. Russian cosmonauts aren't the only orbital residents with the opportunity to vote from space. American astronauts on the space station regularly cast votes from orbit in presidential and local elections as well. Two Americans and a Dutch astronaut round out the space station's current Expedition 30 crew. American station crewmembers can vote from space using an electronic email system under a 1997 Texas law. Those votes are then beamed to NASA's Mission Control room at the Johnson Space Center in Houston and then related to the country clerk's office for the counties of each astronaut. The first American to vote from space was astronaut David Wolf, who actually voted from Russia's former Mir Space Station for elections in 1997.